NEW 2017 edition. What determines colours? What is motion? All colours in nature derive from the fine structure constant 1/137.035 999 1..., the most famous unexplained number in nature. What determines its value? All motion in nature is described either by quantum theory or by Einstein's general relativity, two theories that contradict each other. How can they be unified in a final theory? If you enjoy exploring ideas and checking them against the real world, you will like this volume. It first explains why the past proposals for a final, unified theory of physics – the so-called 'theory of everything' – have failed. Then, the text presents a better proposal: a final theory called the strand model. This model agrees with all experimental data known so far and makes clear, falsifiable predictions. They are being tested in experiments around the world. The strand model – predicts the standard model of particle physics – and allows no alternative or extension, – is based on one simple fundamental principle – and thus is 'beautiful', – predicts general relativity – and allows no alternative or extension, – predicts quantum theory – and allows no alternative or extension, – and solves the open issues of the standard model, gravitation and cosmology, including the explanation of all fundamental constants. These results follow naturally from one simple principle. Prepare yourself for a roller coaster ride trough modern physics, and for the excitement of solving one of the oldest physics puzzles known. This is an adventure that leads beyond space and time – right to the limits of human thought. For example, the adventure shows that the term 'theory of everything' is wrong, whereas 'final theory' is correct. 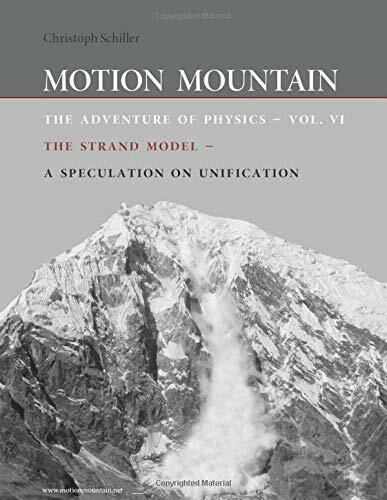 The text presents an approach to the final, unified theory of physics with a simple basis but intriguing implications. The model is based on featureless strands that form space, particles and horizons; the model sums up textbook physics in a single fundamental principle: events and Planck units are crossing switches of strands. Surprisingly, this fundamental principle, which works in three dimensions only, allows to deduce Dirac's equation (from the belt trick), the principles of thermodynamics and Einstein's field equations (from the thermodynamics of strand crossing switches). Quantum theory and general relativity are thus found to be low-energy approximations of processes at the Planck scale. In particular, strands explain the entropy of black holes. As a further surprise, in the same approximation, the fundamental principle yields the three gauge groups and the Lagrangians of quantum electrodynamics, of the strong and of the weak interaction, including maximal parity violation and SU(2) breaking. The three Lagrangians appear as a natural consequence of the three Reidemeister moves of knot theory. The strand model does not permit any further interaction, gauge group or symmetry group. The strand model might even be the first unified model predicting the three gauge interactions – and the lack of other ones. In QED, the strand model proposes a simple understanding of Feynman diagrams and of Schwinger's formula for the anomalous magnetic moment of the electron and the muon. As a final surprise, the fundamental principle predicts three fermion generations, the Higgs boson, and the lack of any unknown elementary particles. The strand model thus predicts that the standard model is the final description of particle physics. The quark model and the construction of all mesons and baryons are shown to follow from strands. In other words, tangles of strands and their crossing switches explain all known elementary particles, all their quantum numbers, and the lack of any other elementary particles. The strand model might be the first unified model predicting the elementary particle spectrum. Finally, a natural method for the calculation of coupling constants, particle masses and mixing angles appears. Christoph Schiller, PhD Université Libre de Bruxelles, is a physicist with more than 25 years of experience in the presentation of physics, the science of motion. His six volumes on physics, written for readers between 16 and 106 years of age, are captivating and thought-provoking on every page.